It’s good to be back home, although I say that with mixed feelings. We spent a week in the Adirondack Mountains and IT WAS INCREDIBLE. If I could buy property up there, I SO would. I have never met anyone who visited the Adirondacks and didn’t gush and gush about how wonderful it is there. We rented a cabin in the wilds of Upstate New York. The Adirondack Mountain Forest Preserve is the largest national park in the contiguous United States, did you know that? It’s classified as a “wilderness.” We didn’t see any bears (apparently where we stayed there are more bears than any other area in the Adirondacks), but we did see deer and I did run over some honking big frogs that for SOME crazy reason were hopping across the roads in a rainstorm at twilight. Dumb amphibians. Oh, and we heard packs of wild coyotes. 😯 They sound HORRIBLE at 3am, did you know that? I was kinda freaked. 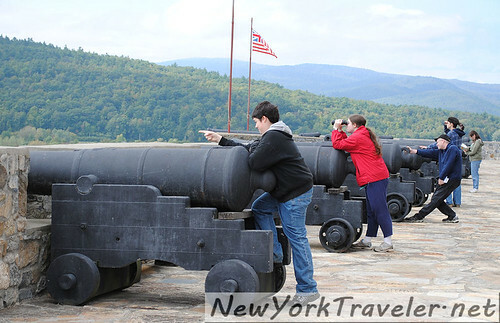 We also visited Fort Ticonderoga, near the New York/Vermont border. We just had a great time. I’ll have more about our adventure once I take a 15-hour nap and get my strength back from climbing Blue Mountain…. Livvy went with us and she had fun, too! What a great trip! I’d be scared to be in the wilderness though with all the wild animals roaming around free. I prefer to visit them in a zoo. Welcome back! I’m surprised your cat liked the trip too! Karen– Livvy wants to go back. She’s been pining ALL DAY today, wanting to return to the cabin. I think she liked the adventure. Lin– LOL!!! My daughter and I were convinced that the frogs were juvenile delinquents, no doubt DARING one another to cross the road while cars were coming. It sure seemed that way. Seeing that your frogs are relatively mild-mannered and obedient, perhaps these flattened frogs belonged to some other poor homeowner. So glad to hear that you had fun!!! I love the Adirondacks too. Moe is going to take a week off from work near the end of October, I hope that we can at least do a weekend getaway.